It may sound like a case of book fanatics being book fanatics—and maybe it is—but Claire deserves the hype because Diana Gabaldon has given us one of the strongest, most intelligent, fiercest heroines not just of the past twenty-plus years, but ever. The reason the Outlander series has been hugely popular through two decades, eight novels (so far) and now a super-awesome TV show is not because we like hot Highlanders in kilts. It’s because we worship Claire. And because we like hot Highlanders in kilts. When we first meet Claire, she’s an English army nurse who is enjoying a lovely post-WWII honeymoon with her husband in Scotland—until she literally falls through time into 1743 and finds herself in the midst of Gaelic-speaking warriors, redcoats and lots of blood and fighting and broadswords. And she survives. Now, I wouldn’t want to put it to the test or anything, but I’m pretty sure if that were me, I’d last all of 0.002 seconds before either dying of shock or, at the very least, getting captured and flogged by Black Jack Randall. I’d be trying to tell everybody in sight that just yesterday I was listening to my husband talk about his boring ancestral family research project, and now I’m in the middle of a Jacobite rising?! I’d be looking everywhere for the nearest telephone and I’d be freaking out about the lack of Purell. But Claire doesn’t just persevere, she dominates. She uses her brains, her medical training, her stubborn will and her sassy mouth to thrive in a place and time where women are—well, not respected, to put it delicately. She puts all the men around her—Scottish, English and Colonists alike—in their place. She’s feared by some, revered by others and loved by just about the most perfect person on the face of the planet. Throughout the series, she faces more trials, hardships, heartaches and downright trauma than one person should know what to do with, but she keeps pushing. Through every adversity, she only gets stronger. The books are a true hero’s journey, one that we never want to see come to an end. It’s not so much that we want Claire to be our best friend—with the kinds of messes she gets herself into, that might prove kind of dangerous—but maybe a really cool mentor we meet with once a year in a completely safe and neutral space where there is no danger of sadist Dragoon captains, pirates, witches or vengeful teenagers. There is a lot to be learned from Claire. How to keep your head up in hard times. How to follow your heart. How to stand up for what you believe in. How to tune out the haters. How to make the most of herbs and berries. How to be your own champion. 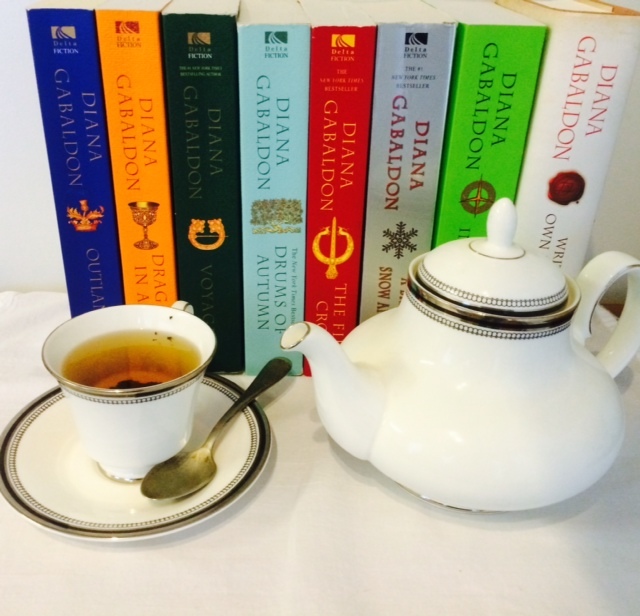 So thank you, Diana Gabaldon, for giving us years and years book-loving joy with the greatest protagonist imaginable. And Claire? Co-latha-brieth sona dhut, Sassenach. Sorry to show up to the party empty-handed, but you’ve already got a Jamie, and you’ve never been a stingy lass. Will you be celebrating Claire’s birthday by re-reading your favorite Outlander passages or re-watching the best episodes? Check out All Things Outlander for more obsessenach coverage. 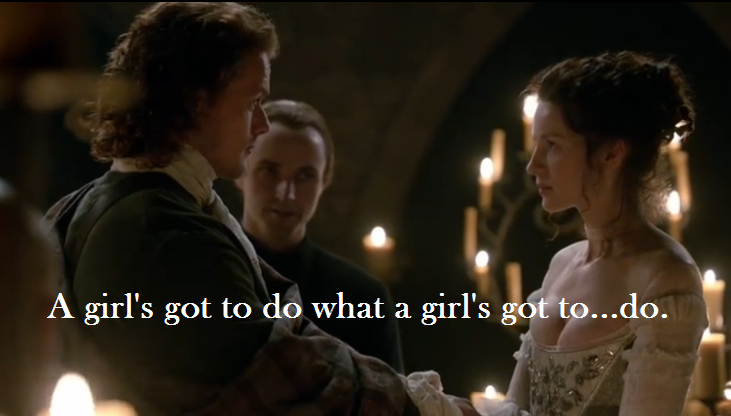 What is it that makes Claire a great heroine to you? Share your thoughts below! Love your way with words! Even if I dinna ken Claire, but I do, I would be intrgued by her! Good job Steph! Love your blog ! Beautifully written, thankyou ! Claire (and Jamie and all our beloved characters) has been part of my life over the last 15 some odd years…I still don’t get exactly WHY I’m such an addict with Diana’s books..”Some stories you read and you close the book and lay it down. Some stories you read and you carry in your heart for ever”, that’s exactly what happened to me with Outlander. Thanks so much! I agree with you completely–there is something so special about these books and characters that makes them stay with you forever!